Rio (left) and Sydney (right) are brothers, who arrived at the Rescue, because their owner could no longer look after them. They are both sweet boys, but they are new to the Rescue and a little nervous at present. We are sure that once they are settled, their personalities will shine through and they will be such loving, friendly boys. 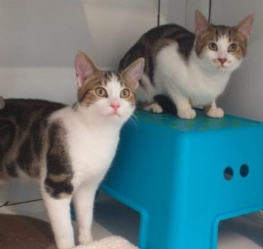 Rio and Sydney are looking for a home together, as they are very close and would need a home with no young children, but could live with other cats.